Your home is the largest investment you may make in your life. Termites are often called the “silent destroyer” because they may be secretly hiding and thriving in your home or yard without any immediate signs of damage. Since termites are a constant threat to your home, here are some things you can do during the year to help maintain the effectiveness of Northern Neck Pest's termite treatments. Small steps make a big difference in termite prevention and sustaining an effective termite treatments. Start by eliminating moisture conditions and termite food around your home. These simple steps make your home a less attractive target, helping deter termites. What are the warning signs of termite and pest infestation? Subterranean termites dwell underground in loose, damp soil and are more common to our area. Interior damage may not become apparent until infestations are full-blown. 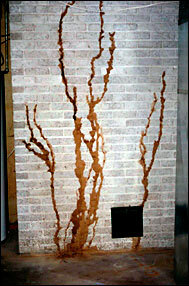 Termite damage sometimes appears similar to water damage. Outward signs of termite damage include buckling wood, swollen floors and ceilings, areas that appear to be suffering from slight water damage and visible mazes within walls or furniture. Infestations also can exude a scent similar to mildew or mold. Drywood termites build their colonies within wooden structures on which they feed. They can be found inside of walls or furniture. Drywood termite infestations may only become apparent after a colony has burrowed so deeply into an infested item that the veneer cracks and the maze-like tunnels beneath become visible. Such damage is common in antique furniture pieces and older homes. Rodents multiply swiftly, and infestations may be extremely difficult to exterminate. It is advised that anyone experiencing a rodent infestation contact us for free estimate and consultation.